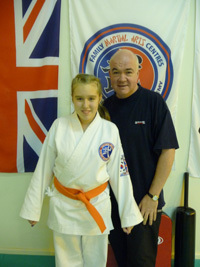 As a family we have really enjoyed training at family martial arts centres. We have found that the lessons have something for each of us so that we are all interested in what we are doing. Our training has given us confidence and greatly improved our fitness and physical skills. We find training as a family keeps us motivated and we enjoy discussing what we have learnt at home and practising together. The atmosphere in the lessons helps us feel more positive and that we are well supported both by the instructors and the other students. Everyone is very helpful and friendly. The leadership training has helped us in many areas including our work, school and home life. Since our children joined the school 18 months ago we have seen a massive difference in all parts of their life, not just the fitness and physical health, but also their school work, general outlook and respect for others and themselves. 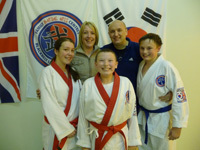 All three are now full of confidence and have a very positive personality, all which has been helped by attending the Family Martial Arts Centre in Leyland. Would recommend this school to anybody and indeed have. And look forward to seeing our children grow and develop more over the coming years. 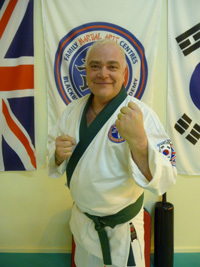 Now in my late 40s and having tried jogging, cycling, countless gyms, and being thoroughly bored with them all, I joined the FMAC in Leyland In May 2009 to learn the martial art of Tang Soo Do. My motivations are purely for health reasons, to get fit and to shed weight gained in my latter years. 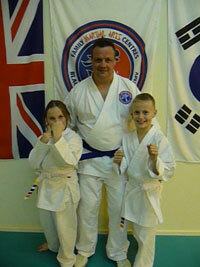 The Tang Soo Do training disciplines are very enjoyable and at times can be challenging. For me, having an instructor is like having a personal trainer which in itself brings constant motivation and a desire to continue in this activity 2 or 3 times per week. 6 months on, I am fitter, healthier and stronger, and although adulthood brings many life skills, I am extremely impressed with the regular teachings of leadership skills and disciplines required to be successful in our endeavours, especially to our younger members. They learn and understand the true meanings of honesty, confidence, courage, and self respect, along with other disciplines necessary for them to achieve their goals, and to guide them respectfully through life itself. The staff members are polite, and display enormous respect to everyone. The service they bring to this academy is second to none, so come along, bring your children and start on the road to be a leader in life. For me and my children Family Martial Arts is more than just a form of exercise it’s a way of life, forget brain training and lonely gym workouts, it’s all here – mentally and physically rewarding. Great commradery from top rank to the latest fledglings. Team bulding reigns supreme here. I am a changed man in just 6 months of membership. My family and I have attended the Swinton academy for three years now. There is always a friendly and encouraging atmosphere in the school and the instructors are always willing to answer any questions or give advice on any aspect of the training we need help with. They regularly go out of their way to assist each of us in our own personal journey. We all enjoy the classes as a family and I find there is something for each of us individually:The youngest of my sons Daniel is in the Tiger Tots programme which teaches children life improvement skills such as to respect elders and not talk to strangers. The classes are energetic and he has great fun running, kicking, jumping and shouting and is always eager to show me what he has learned in the class and how high he can kick.Connor who is eight has now progressed out of the Tigers and into the leadership and takes his new longer classes more seriously, eager to learn he works better in a mixed class of children and adults.Declan my ten year old is naturally very supple and talented and the training brings out the best in him.Holby my fourteen year old who is generally reluctant to participate in any physical activity really enjoys the classes and responds well to the encouragement of the trainers, he also likes learning about the history of the martial arts.Myself, I like the traditional structure, discipline and respect of the classes. Training has given me the kind of confidence and a level of fitness that I haven’t had before and it has given us as a family an activity we all are interested in and doing together. 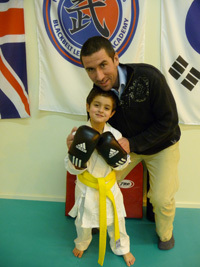 My 6 year old Addison has benefited a great deal from his participation in the Tiger Tots programme. We have noticed an improvement in his confidence, concentration and has developed an attitude towards listening and learning which is exactly what I wanted for him. 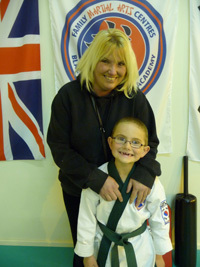 Family Martial Arts Centres, have worked wonders for my son Joshua, he is much more motivated and responsible. His schoolwork has improved, as has his behaviour. He looks forward to coming to class all the time. Tiger Tots has helped my son’s confidence and he really enjoys being part of a team. He also enjoys filling in his home self-improvement charts, which really help me control his behaviour at home. I have seen a great change in James’s attitude which was noticeable after only a few weeks. The discipline that Family Martial Arts Centres instils in him is fantastic and can only give him greater benefits for future life. 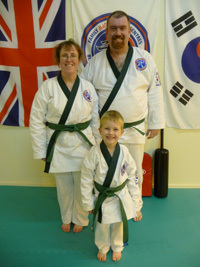 The Family Martial Arts Centres has helped give my two children (Heather & Adam) extra confidence and discipline which they have taken to school which has helped them achieve better grades recently! They also enjoy it immensely.